I just completed a retreat weekend with an organization/team that labeled themselves as dysfunctional. I decided I would use a Friday night after dinner presentation to set the stage for a Saturday facilitation where they would examine their current practices and decide on what commitments for change they were willing to make. Several years ago I saw a cartoon and it changed my definition of dysfunctional. Dysfunction is pretty normal. It’s probably safe to say that all teams have dysfunctional times. So I rephrased the elements to focus on what needs to be done to build increased team effectiveness. Building Trust– I think knowing each other is the initial step in building trust into a team, Structuring purposeful opportunities for sharing oneself and listening to others is a start. If trust is present, team members will ask for help, accept questions from each other, and risk offering feedback to colleagues. Work through Conflicts—Communications skills are needed for working through conflicts. Listening to each other and informing people with differing opinions that you have heard and understand their views is helpful. I recommend practicing open questions and paraphrasing in structured ways. A facilitator can remind teams to consciously use these skills when conflicting views emerge. 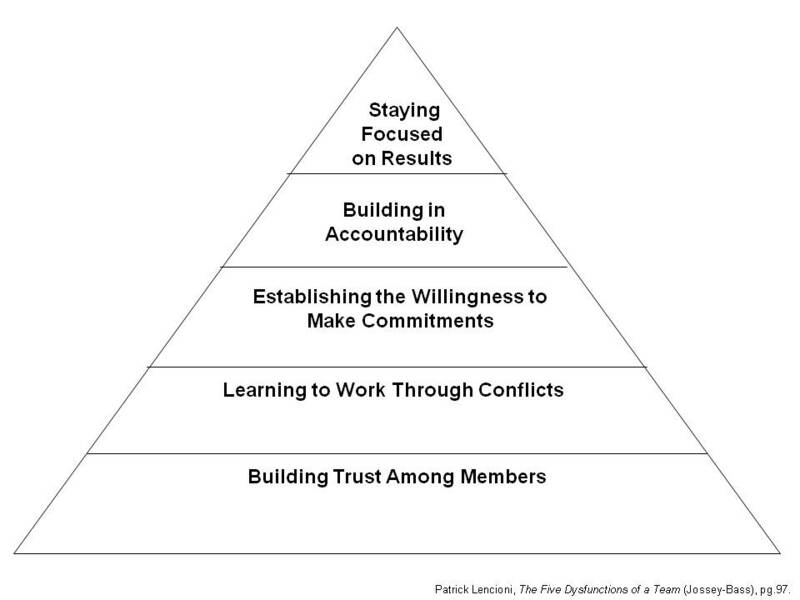 Building in Accountability—“Members of great teams improve their relationships by holding one another accountable, thus demonstrating that they respect each other and have high expectations for one another’s performance.”(Lencioni-213) I recommend that a recorder keep track of tasks that individuals agree to carry out and that the meeting end with a review or notes be sent out as a follow up. Staying Focused on Results— Teams frequently find that the urgent and “not so important to our results” issues can fill a meeting’s agenda rather quickly. It’s critical that team leaders find opportunities to bring reminders about our results into the conversation often. A school leader in a workshop with me this week shared his realization that by the middle of October, he and his leadership team had drifted away from a results focus that they had set in August. Day to day demands had clouded the focus. You always have a way to frame my thinking! One point that really jumps out is the day to day tasks can easily cloud meeting agendas. This really gives me many things to ponder! Thanks once again! I just returned from facilitating two days of professional learning for principals in Kentucky. Our second day was focused on the role of principal as architect. Through a simulation, we unpacked the essential elements for highly effective teams. I included Lencioni’s triangle but like negating the assumptions and presenting a positive spin. Thanks for the insight.